We have teamed up with Cloudflare Inc. All our customers can now enable Cloudflare on all hosting servers and benefit from a huge boost in speed and security. The loading of Cloudflare enabled websites increases on average by ca. 50%. At the same time there are major enhancements in security and in protecting you and your customers from DDoS attacks while incoming SPAM is noticeably reduced. As a Cloudflare Certified Partner, we are providing to all of our customers the ability to enable Cloudflare's free plans across their websites. Over six million websites run on their network. Once your website joins the Cloudflare network, you will notice considerable performance gains and protection against a range of online threats. Cloudflare is a content delivery network (CDN) that increases the performance and security of every website on its network, protecting from a broad range of threats and attacks. As your traffic passes through the data centers and the CDN system intelligently determine what parts of the website are static versus dynamic. The static portions are cached for a short period of time, typically less than two hours before being checked for possible updates. By automatically moving the static parts of websites closer to the website's visitors, the overall performance of your site improves significantly. This intelligent caching system also means we all save bandwidth, which decreases the server load, which again means web applications will run faster and more efficiently. On average that comes to a 60% decrease in bandwidth usage, and a 65% in total requests to the actual hosting servers. The overall effect is that Cloudflare will typically cut the load time for pages on your site by a stunning 50%. And since the traffic from and to your server or your hosting account with us is filtered, SPAM can be reduced and DDoS attacks fought off. Once the account is set up, each hosting customer can decide on the level of such security filtering, can decide on the "Caching Level," "Security Level," and "Auto Minify" level. 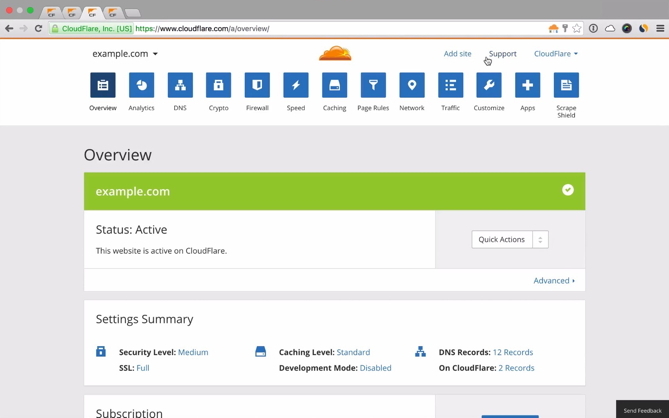 Video copyright © 2017 Cloudflare Inc.
To start using the service, you will need to log into your hosting control panel and find the Cloudflare icon. After clicking this icon, follow the provided steps to activate Cloudflare. (Alternatively, but just if you only host a single domain with us, you can also set this up from within our billing/admin panel at basicnetworks.net; under SERVICES click on the "Active" tab.) And as mentioned above, we are pleased to provide the service to you for free. If you have a VPS or dedicated server with us, we will be delighted to activate the free Cloudflare service for you as long as you have a cPanel or Plesk hosting control panel installed. No need to update existing nameservers. However, this only speeds up "www.domain.com" (NOT "domain.com"). (b) "Cloudflare Free with Cloudflare DNS"
This is the full setup. The authoritative nameservers for a domain name will need to be updated at the registrar to point to the displayed Cloudflare nameservers. With this setup both "domain.com" and "www.domain.com" will speed up. 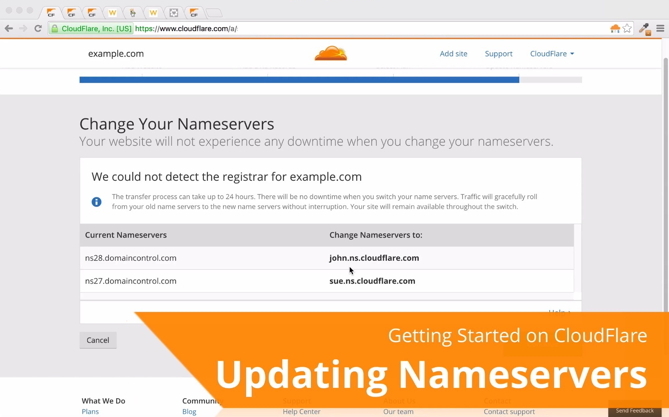 VIDEO: How to update the nameservers for the (b) setup? Newly created hosting accounts will then already include that zone (as it had been until 2014 by default).